This is the reissued edition of the German version of The Blessing Way. 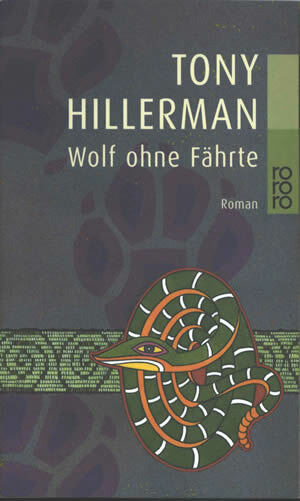 The German title translates as The Trackless Wolf. This edition was published in 1991 by Rowohlt Taschenbuch Verlag in Reinbek bei Hamburg, Germany. The German translation is by Gisela Stege. The cover design is by Cathrin Günther, and the illustration is by Jürgen Mick. On the front cover, wolf tracks in purple on a speckled gray background provide a backdrop for an illustrated beaded band in shades of green and gray, with a spiral motif. Overlaid on the right side of the band is a coiled rattlesnake in darker green with white stripes. The author's name, book title, and "Roman" are printed over the illustration alongside the publisher's logo. The back cover shows, printed in white on a gray background, a synopsis of the novel along with the publisher's logo, bar code, and price. The inside front and back covers are blank and are leaf green in color. Binding: Full-color paper covers. The author, title, series number, and publisher logo are printed on the spine.